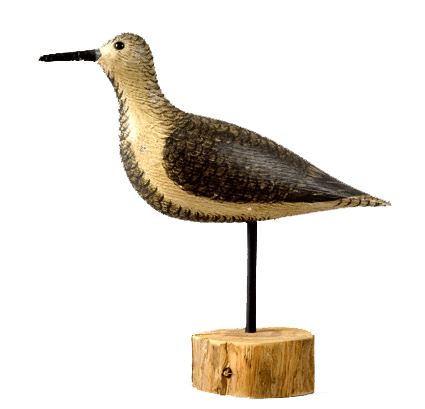 Presented here, a very fine Shorebird Decoy. Species is a Black Bellied Plover and the paint is very realistically done. Nicely patinated surface shows only minor wear. The bird is structurally sound, carved from pine with glass eyes with excellent detail to the paint pattern. We would date this bird to the first quarter of the 20th century, possibly to the 1930's. I rather doubt that it was actually used as a decoy as hunting shorebirds was outlawed in 1918 but that is not to say that everyone complied with the law. We would choose to view this carving as a fine example of American Folk Art. Sometimes defined as the uncommon art of the common people, Folk Art refers to the trappings of everyday life decoys, weathervanes, quilts, hooked rugs infused with a spirit that transcends their original practical purpose. Most Folk Art, by its very nature, is anonymous. It is the work of people, not names. The product counted, not the man. While it is satisfying to look at a decoy and state with authority the name of the carver and the provenance, this is not always possible. According to Bob Shaw, curator of Vermont s Shelburne Museum, which houses one of the world s most extensive decoy collections, "Decoys are distinctive among folk arts because they are strictly a North American phenomenon. All the others can trace their roots overseas, but decoys were created on this continent as a response to the incredible natural world the settlers found here. For most of us, decoys are a link to a different order and a different time"
The ultimate test of a true artist is in his ability to capture the spirit of an object which is its life, to freeze it in time and then release it when someone looks at it 100 years later. Our carver was very successful in his accomplishment. Size is 11" from the tip of the bill to the end of the tail and is 9-1/4" tall, including the stand.